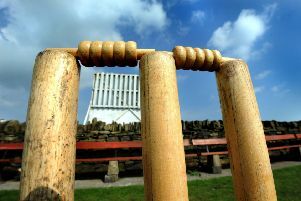 Bedlington’s first XI travelled to Lanchester on Saturday and suffered another crushing defeat. Ben Harmison was available for the first time this season and returned to the team along with Darren Leason, Craig Robinson and Chris Younger. On winning the toss, skipper Sean McCafferty inserted the opposition and opened the bowling with Younger and Robinson. The hosts made steady progress until Robinson made the breakthrough having Green caught by McCafferty for 12. New batsman Nidanmanura offered an early chance off Robinson but it was not taken. Despite a fine spell of bowling from Nicky Douglas (1-45 off 13 overs) the hosts made relatively untroubled progress to finish on 305-4 from their allotted 50 overs. Patterson (66), Nidanmanura (58), Halliday (55), Brinton (47 not out) and Taylor (39 not out) all contributed. The fielding display by the visitors was poor with a number of misfields resulting in boundaries and some dropped catches proving costly. Harmison and Michael Levison opened only for the former to fall for ten. Younger (24), Levison (32) and McCafferty (31) all made useful contributions to take the visitors to 115-3. The fall of McCafferty signalled the customary collapse to see the innings subside to 130 all out. A spokesperson for the Hirst Head outfit said: “The game was further evidence of the massive step up from the A2 division to A1. “The loss of the experienced Paul Rutherford and Dan Younger before the season and the inability to add a full-time professional player means the whole season will be a struggle. Meanwhile Bedlington’s second team picked up a fine 12 runs victory with Ian Anderson’s superb 141 not out and Bob Gibson’s 42 not out providing the backbone of the home side’s 240-5. The visitors were always in with a chance for victory but two wickets each for Brad Purvis and Callum Easton with two run outs from Lee Hutchison saw the hosts run out narrow victors. On Saturday, June 6, Bedlington’s first team host Swalwell whilst the seconds travel to the same opposition.